If you're missing that certain chill in your life, follow these steps to repair your ice maker. You'll be on the rocks again in no time! Turn off the water, unplug the refrigerator and pull it away from the wall. Locate the water filter, if your ice maker has one. It will look like a canister or cylinder and will be attached to the water-supply line. Using the adjustable wrench, disconnect the end of the filter that runs to the refrigerator while leaving the other end of the filter attached to the water-supply line. Hold the filter over a bucket and ask a helper to turn on the water-supply valve. If water flows freely, the filter is good. If water dribbles or doesn't flow at all, the filter needs to be replaced. Turn off the water-supply valve and disconnect the filter from the water-supply line, using your adjustable wrench. Buy a replacement filter at your appliance store and install it. Tighten the connections firmly to prevent leaks. Pull the refrigerator out from the wall and unplug it. Turn off the water-supply valve. The valve may be under the kitchen sink or connected to a cold-water pipe in your basement. Inspect the water-supply line that runs to the refrigerator, looking for crimps or kinks. Carefully straighten any problem areas you find, using just hand pressure. If you can't remove the crimps and kinks, replace the water line. Disconnect the line from the refrigerator and from the water-supply valve, using an adjustable wrench. Buy a replacement line at your appliance store and install it, tightening the connections firmly to prevent leaks. 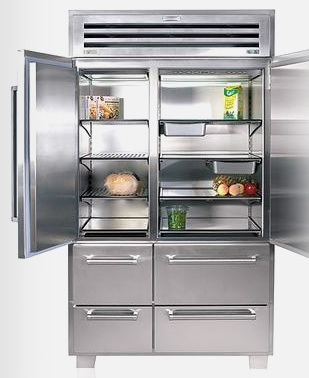 Remove the bottom access panel on the back of the refrigerator, using a screwdriver or a nut driver and socket. Remove the water inlet valve using the nut driver and socket. Disassemble the valve and clean the screen.